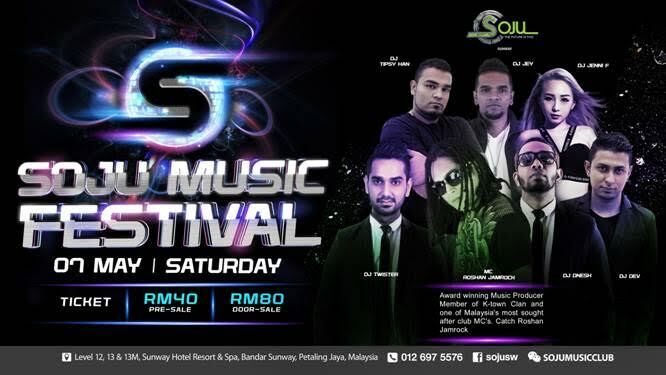 Experience the insanity of SOJU MUSIC FESTIVAL at Soju Sunway on Saturday, May 7, 2016 at 9pm. It is the most buzzed-about event where the best beats and dance music come under one roof for you to party to your heart’s content. Guest MC Roshan Jamrock is set to bring the house down while the unstoppable DJ Jenni F, DJ Twister, DJ Dnesh, DJ Tipsy Han, DJ Jey and DJ Dev will deliver addictive remixes and the latest electronic dance music. 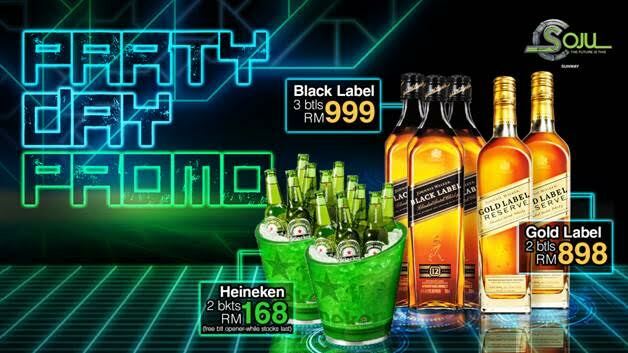 Also enjoy the promotional prices for Black Label (RM999 / three bottles), Gold Label Reserve (RM898 / two bottles) and Heineken (RM168 / two buckets) at the event. Be part of the madness at the most happening nightlife venue in Petaling Jaya! For more details and enquiries, please call Soju Sunway at 012-697 5576.